When was Grappa first made? The answer to this question is not easy. The production of wine distillate, for example, became known when the Padua doctor Michele Savonarola (1384 – 1462) published the first treatise on the subject: “De Conficienda Aqua Vitae”. The distilling of marc probably began in the 14th or 15th century, or perhaps even earlier. In many publications dedicated to the history of this distillate, reference is made to a document regarding a certain Enrico di ser Everardo of Cividale del Friuli. It appears that in his will he left “unum ferrum ad faccendaacquavitem” (an alembic still for making aqua-vitae), and that in the same document a grespìa[f1] is also mentioned. However, there was never any proof to support this anecdote, and the will was never made public. Grappa was not an aqua-vitae intended for the well-off classes, who preferred wine or its distillate, leaving the common folk what remained, i.e. the skins, seeds and stalks of the fermented grapes. This Grappa was certainly very different from the distillate we know today. It must have been drier, and sometimes even saturated with unpleasant and pungent substances: Grappa existed over the ages with such characteristics of a plain, strong and invigorating drink. Grappa finally won a place in history during the First World War, and Monte Grappa bore witness to its importance. In fact, it became the liquid courage used by the Italian Alpine troops to face situations of danger and difficulties. The Grappa of yesteryear was hand-made with double-boiler or direct flame stills with discontinuous cycle. Industrial distilling methods - which reached Italy only in the middle of the last century - were not yet used. Nor were Grappas from a selection of a single grape variety very diffused yet, except those of Muscat or Malvasia; there was mainly the classic White Grappa, distilled from mixed marcs. In the period after the Second World War, Italy enjoyed a moment of unprecedented growth. Italians changed their lifestyle, favoured by better economic conditions. Tastes changed radically, and with them also the approach to Grappa. 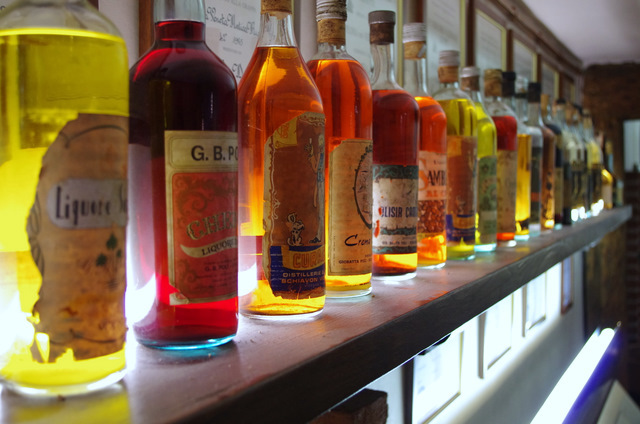 People began tasting Grappa, gradually giving up the habit of drinking without caring about the taste or alcoholic strength. Along with the changing tastes and habits, also Grappa became smoother and less aggressive, revealing all its quality, even through long ageing in wooden barrels.